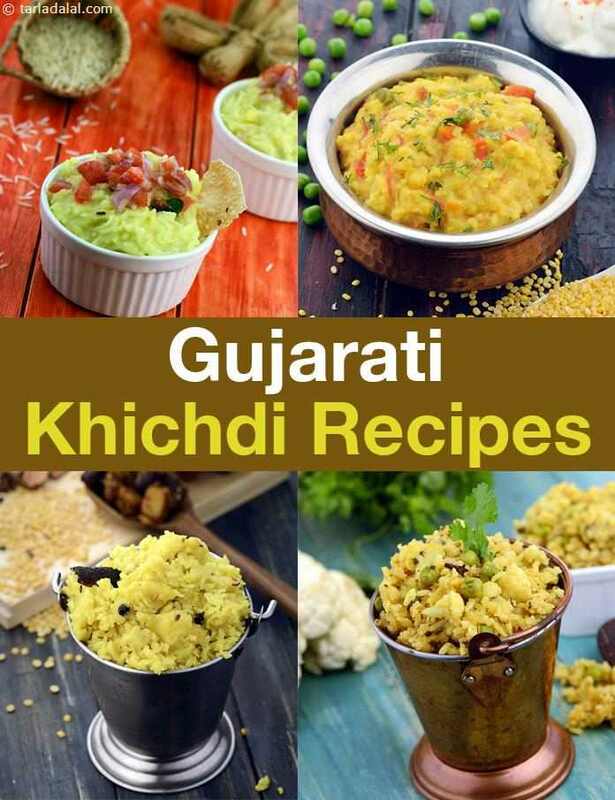 We bring you a large collection of Gujarati Khichdi recipes along with some Gujarati Rice recipes which are enjoyed with a Gujarati Kadhi or simple a cup of curds and some pickles. Many Gujarati Khichdi recipes make a meal by themselves. One dish meal means thats your main course and all you need is a glass of Chaas with it. In fact. we make Fada Ni Khichdi and Panachamel Khichdi often in our home. There is also Toovar Dal Khichdi which is a class apart due to aromatic spices used. We have made lots of healthy Gujarti Khichdi recipes as our team works extensively and passionately on this subject. Tarkari Khichdi is loaded with lots of vegetables and moong dal. Want to skip oil and ghee, then try Zero oil Fada Ni Khichdi. Need an iron boost, then its Masoor Dal and Vegetable Khichdi. Want a quick method, then our microwave Fada Khichdi will do it. Use the Indian deep iron pan called "handi" to increase the iron conent and boost your haemoglobin levels in Handi Khichdi. Indians love curd and it blends beautifully into Dahiwala Moong Dal Khichdi. For a quick khichdi and corn lovers, a must try is Makai Khichdi. Love brinjal then try the zero oil Brinjal Onion Khichdi. This section also looks at rice dishes like Lilva Rice, Ek Toap Na Dal Bhaat, Gujarati Masala Bhaat that are easy and simple to make, and prepared often to make use of leftover rice. Enjoy our Gujarati Khichdi Recipes. You will find our other Gujarati Recipes articlers of interest below.